Goodreads Summary: Once upon a time, an angel and a devil fell in love and dared to imagine a world free of bloodshed and war. 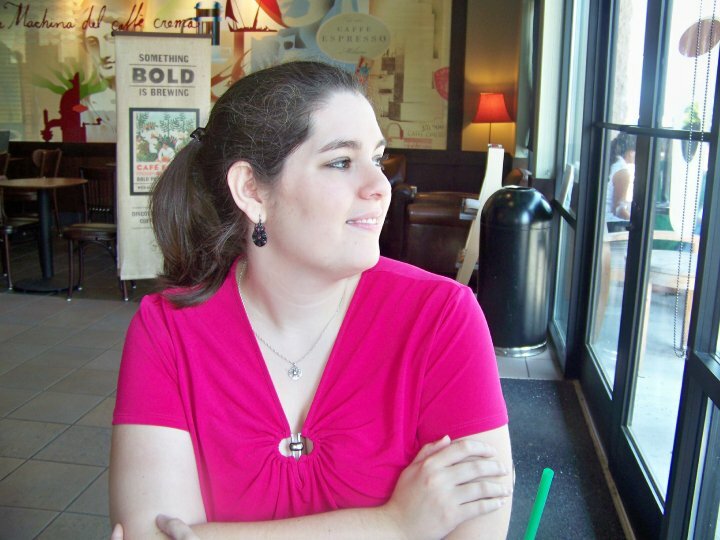 I read Daughter of Smoke and Bone years ago, but the story never completely left my mind. Karou and Akiva’s characters always haunted me, and I finally decided that I couldn’t want any longer to see how everything played out for them. Even though I still have the third book to read, I am so glad that I finally took the plunge and read this sequel. 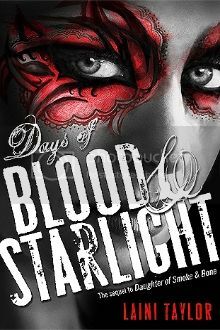 Days of Blood and Starlight begins soon after the events of the first book, but the tone is quiet different. The world of Eretz is a darker place, filled with bloodshed among both the seraphim and the chimera. 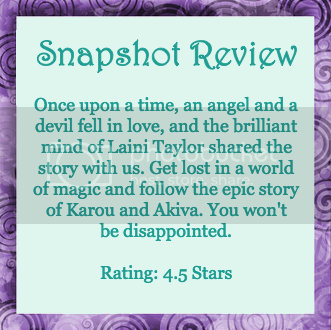 Karou and Akiva both must come into their own during this book. Each time the point of view shifted, I longed for the one left behind. Once again, Laini Taylor gives us a glimpse into a sweeping, expansive world, showing where humans intersect with magical creatures. The images she creates made me believe that I was in the desert and able to glance up at a sky of endless stars. I loved the fact that we got to dive deeper into the world of the seraphim and learn more about the different tribes of chimaera. In addition, Zuzanna and Mik are back with Karou, and we see a lot more of Akiva with Liraz and Hazael. The banter between these characters kept the book from being too somber, and even though there was an undercurrent of tension due to the war, there were definitely moments of laughing out loud. As for the main characters, they are definitely changed in this installment of the story. So often I just wanted to hug them both and tell them that it would be all right. However, “all right” can’t really be a thing when the world is about to be at war and two soulmates are separated in class Romeo and Juliet style. I don’t want to say too much for people who haven’t read this yet (and what are you waiting for? ), but the new aspects of magic, the challenges faced, and the truths revealed make for one compelling story. Most Memorable Aspect: I loved the quotes interspersed between sections. But really, I love the story and the characters. They haven’t left me in years.